The timeless pikake is from the jasmine family and is made of tiny white ball-like flowers which emit a sweet, heavenly fragrance. 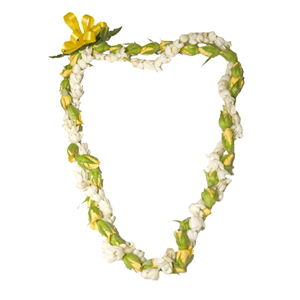 A strand of roses add a romantic and loving touch to the fragrant white blossom. Tip: Although one strand of Pikake looks beautiful with roses, try two or more for a fuller look. NOTE: For the hot summer months of May through August, we recommend and guarantee the freshness of Pikake using overnight shipping options.